Members of the Maine People's Alliance delivered more than 7,000 petitions and hundreds of postcards and personal messages to the Maine House and Senate today urging legislators to accept federal funding to expand health care coverage. "Without this expansion, there are several studies now available that show that there will be excess deaths of between 31 and 157 Mainers this year, because of our failure to accept this money, fellow citizens-wives, husbands, children," said Dr. Stephen Sokol of Lewiston, speaking at a media event before the delivery. "953 of our fellow Mainers will face bankruptcies because of catastrophic medical expenses. Many more will see their health conditions deteriorate because of lack of access." The petitions, collected by MPA and national organizations CREDO Action and MoveOn, were delivered as lawmakers continue to debate legislation to accept the federal funds in the shadow of a promised veto by Governor Paul LePage. Similar legislation passed with a bipartisan majority last year, but just short of the support needed to overcome LePage's veto. Two Mainers who would gain access to health care coverage if the expansion were approved also spoke at the event, and placards bearing the faces and stories of a dozen others were strung on a clothesline meant to show that their lives are on the line in the legislative debate. "I am scared to think what is going to happen to my husband when l can't refill his medications because the doctors won't renew the prescriptions until they see him," said Patty Kidder of Springvale, whose family recently lost their MaineCare coverage and whose husband has been hospitalized for depression and an auto-immune condition. "He and l are both over due to see our Primary Care Physician and can't afford to make an appointment because you must pay at the time of the visit. $150 when you are surviving on $900 cash per month is impossible." "I'm already out of my anxiety medication and I'm almost out of my depression meds and the last time that I went off this medication, I was hospitalized," said Jedidiah Shattuck of Lewiston, who lost health care coverage on January 1st. "I also suffer from chronic pain from a work-related injury from when I worked at Morin Brick Yard. The last time I saw a doctor he found cysts on my kidneys which suggests I might have Polycystic kidney disease. Now that I've lost MaineCare, I don't know how I'll be able to follow-up on these serious health issues. I have no way to afford my medications or to see a counselor." 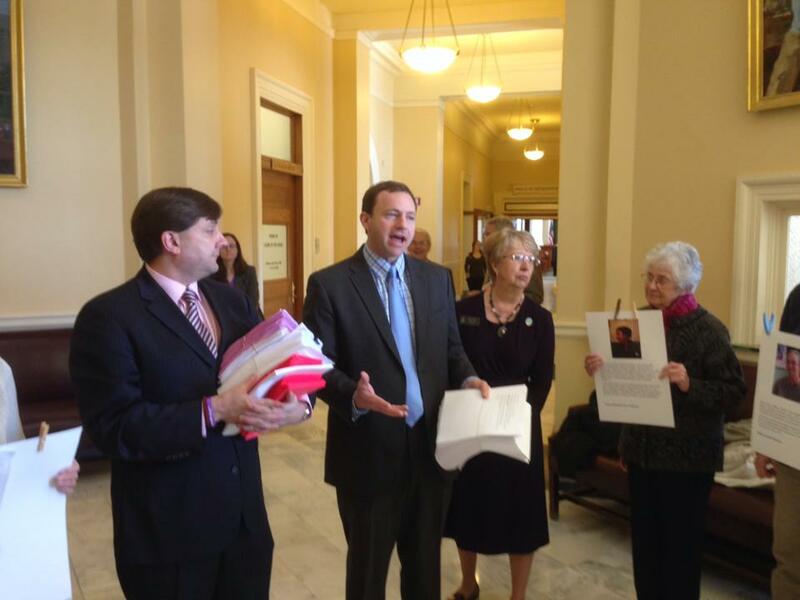 The petitions were accepted by House Speaker Mark Eves and Senate Majority Leader Troy Jackson.